Celebrate with a filet and a chilled martini, or go for the jazz and scotch. : Sullivan's has a warm vibe and boasts signature steaks, professional service and a chance to see local VIPs and pro athletes dining at nearby tables. From the seared rare ahi appetizer to the iceberg wedge slathered with creamy blue cheese dressing and the filet, Sullivan's offers a memorable dining experience. It’s not all about the beef at this steakhouse, however; the salmon and pan-seared bass are popular, as are sides such as shaved Brussels sprouts and garlic horseradish mashed potatoes. 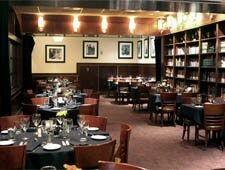 The wine and spirits list is extensive and servers can assist with selections. They can even suggest an after-dinner drink or espresso to accompany the house-made warm chocolate cake with raspberry sauce.